Raising your car from the ground by a few inches can make all the difference when servicing your car. High quality car ramps can be used for oil changes or other car maintenance and is much cheaper than your conventional garage car lift. 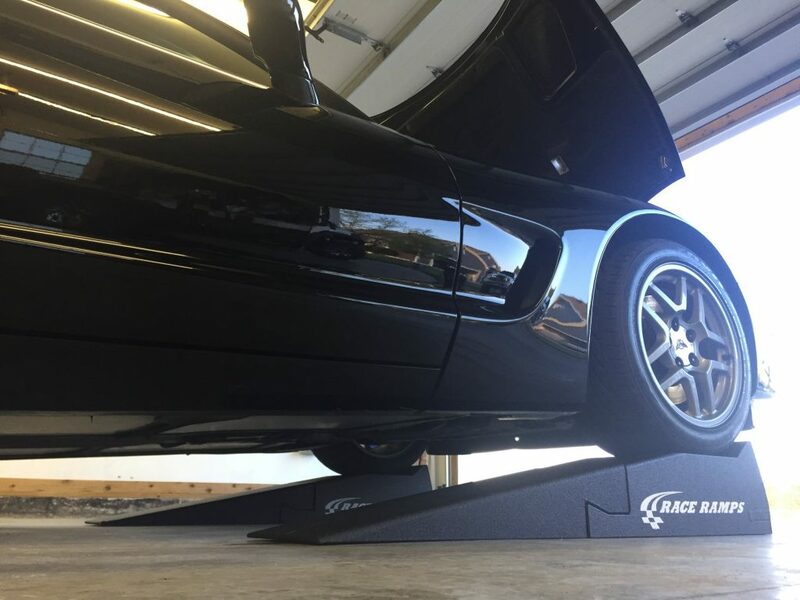 The best car ramps are the Race Ramps Car Ramp Kit, which includes a race ramp, Xtender and wheel chock that is highly rated by professional mechanics worldwide. Car ramps can come in different designs from heavy duty to low profile as well as different materials used in the construction. You should choose a ramp suited to your vehicles weight otherwise you may cause additional stress to the ramps. Car ramps are the best alternative when compared to the more expensive 2 and 4 post garage car lift. You will not get the height of a lift but the additional lift you get from the car ramps ensures you have enough room to perform automotive tasks. You can have the best floor jack on the market but there will still be the worry of it become unstable. Therefore, many mechanics will upgrade their car jacks with a quality car ramp for additional safety whilst underneath the vehicle. On the topic of safety, most car ramp kits should come with wheel chocks that ensure your car will not roll whilst on the ramp. Below is a list of the best car ramps that will lift the majority of vehicles and allow you to perform a number of tasks in safety. Race Ramps produce a huge range of car ramps for a range of vehicles and are very popular across the US. If you have a sports or lowered car, we highly recommend that you purchase the additional kit as it makes getting on the ramp far easier. The full car ramp kit by Race Ramps includes a pair of ramps, pair of “Xtenders” and four rubber wheel chocks. This is everything you need to load a range of vehicles onto the ramps safely. The “Xtender’s” come into play if you have a lowered car or sports car. It lowers the angle (6.6 degrees) to make it easier to get onto the ramp without causing any damage. Overall, the Race Ramps kit is expensive but a worthwhile investment to those that regularly lift their car. It is the best low profile car ramp and is very lightweight yet highly durable to withstand years of use. If you are not confident that the plastic or hardened rubber ramps will hold your car, Rage Powersports offer an all aluminum construction. Many mechanics will argue that metal car ramps are far more durable and they generally prefer them. With the longer and wider design, these metal car ramps are ideal for larger vehicles such as SUV’s and trucks. Overall the Rage Powersports ML-1066 Car Service Ramp is a great all aluminum alternative and is the best heavy duty car ramp. Rhino Gear produce a range of rugged automotive products and these ramps follow that reputation. For example, these car ramps are able to hold a gross vehicle weight of 12,000 LBS, which is highly impressive considering its low cost. As stated above, the construction of these car ramps is resin. However, these have been tested and proven to be as strong as steel and meets the P.A.L.D (Portable Automotive Lifting Device) standards for peace of mind. Overall, they are the best cheap car ramps that will be suitable for a range of vehicles with the large GVW rating and wide design. The Nicky Nice car ramps are constructed of steel and are fairly compact at just 35 inches long when compared to alternatives. The design also differs as it uses extruded traction holes that provide superior grip when loading your vehicle onto it. Suitable for 9 inch wide tires. These steel car ramps are much cheaper compared to Rage Powersports aluminum alternative and can handle more weight too. The only criticism is the fact they are smaller and may be harder to load the car onto compared with the Rage Powersports. Overall they are the best cheap steel car ramps for the money and matched with wheel chocks, they can be made even better. In terms of a heavy duty and high capacity ramp, the OTC 5268 is a 20 Ton truck ramp for professional mechanics working on heavy vehicles. These are not your average car ramps and are fairly expensive but a worthwhile investment for those working on trucks regularly. Overall, these are heavy duty truck service ramps that are expensive but the specs speak for themselves. If you are a mechanic or have large and heavy vehicles, these truck ramps are the best option for your requirements. When it comes to a car ramp that is holding your vehicle in the air, your life is in jeopardy as it could fail. Therefore, its crucial that you purchase an auto ramp that is suitable for your vehicle in terms of weight capacity and tire width. Car ramps in general come with in a range of different designs and materials used within the construction. Popular materials used are steel, aluminum, resin and other durable materials. They have a range of uses that include performing a simple oil change to be used within showrooms. To help you make an informed buying decision, we have created a detailed buying guide that covers all aspects of car ramps. 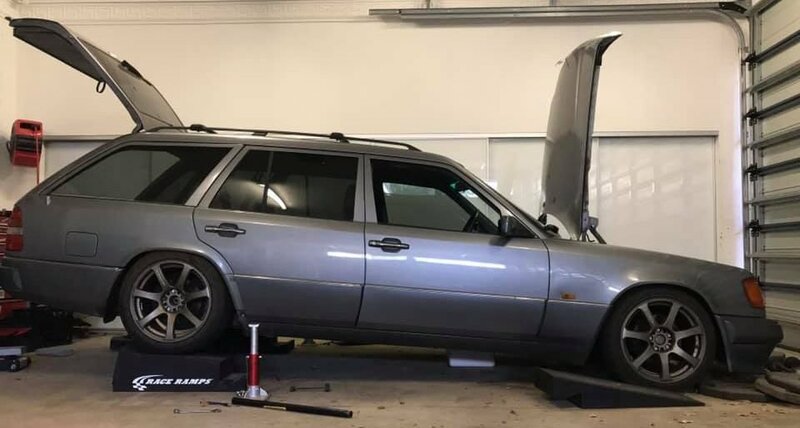 Before purchasing a car ramp, you need to measure the axle weight of your car, which is usually the heaviest at the front. All of the recommended car ramps above have their axle weight listed, where all are suitable for the average car. Some car ramps use single axis ratings as opposed to GVW (Gross Vehicle Weight), which are usually noted. Remember never to overload the ramp because your life will depend upon the ramp holding the weight whilst you are underneath. If you own a sports car with wide wheels, be very cautious on the wheel width ratings. The majority of car ramps cater for all passenger cars with the OTC ramp rated for much wider wheels from trucks. Once you have your vehicle loaded onto the ramp, safety is something you want to ensure is paramount. Wheel chocks are the best form of safety as they ensure your car doesn’t roll on the car ramp. We strongly recommend buying a set of wheel chocks if they do not already come with the car ramp kit. You will notice that all of the recommended car ramps include either serrated or punch plated ramp surfaces. The purpose is to ensure the car has optimum traction when loading and off loading. For those that create homemade car ramps, they will most probably use a blank of wood with no traction features, meaning its virtually impossible to load safely. Not every car ramp will be suitable for your car as ground clearance can be an issue. If you own a low car, choosing low profile car ramps are highly recommended and will safe you a lot of hassle trying to load your vehicle each time. As a rough approximation, below 10 degrees would be recommended if you class your vehicle as low. If your car long, ground clearance may still be an issue as you may end up scratching the undercarriage as you drive onto the ramp. Although car ramps are far safer than the alternative car jack stands, it is still important that to take safety precautions. The obvious safety tip is that you ensure the ramp is placed upon a stable surface because as the car is loaded, it could potentially fall over or even break. It needs to be correctly positioned on a stable surface with no more than a 5 degree incline to make it easy to drive onto the ramp. Once you have loaded your vehicle onto the car ramps, you should ensure the brake is securely locked on. Putting the car in gear with the handbrake engaged is essential and prevents the vehicle from rolling backwards off the ramps. For further safety, we highly recommend placing wheel chocks behind the rear wheels as a backup in case the brakes fail. To prevent any damage to both the car and the car ramps, its important that you load your vehicle correctly. To begin with, have the wheels pointing straight and then slide the ramps against the front wheels and ensure they are centered with the tire. Repeat this for both of the ramps and ensure that the surface is stable. Once positioned correctly, simply drive forward onto the ramp until you have reached the edge. Most car ramps have a bump, which helps indicate that you have located the wheels correctly. During this stage, it really helps to have another person watching you drive onto the ramp. Finally, once loaded and positioned correctly, you will want to put the vehicle in park (or in gear for manual) and engage the handbrake. If your auto ramps come with wheel chocks, place them behind the back wheel. Car ramps are fairly easy to use and the most important thing is that they are positioned correctly and are suitable for the weight of your vehicle. Watch this video tutorial for safely loading your vehicle onto the ramps. Thanks to the advancements in technology, plastics, molded foam, resin and similar materials are being used within the design of car ramps. They are able to handle large amounts of weight that are similar to steel car ramps but with the benefits of being more lightweight. Choosing between the materials is a matter of preference but many professionals will prefer the steel or aluminum ramps. For those that do not have a car lift and want additional safety over using car jacks and jack stands, then car ramps are the best option. Not only are they easier to use but they are more stable, which adds to the overall safety when working underneath your vehicle. All of our recommendations provide excellent compatibility with a range of cars. This is thanks to wide tire tracks, low angle of approach and large weight capacities.